Figures Tony Wu would be the one to point this out. Of course goodness knows if you follow whales around with a camera, poop you will see from time to time. But it appears we aren't getting enough - a lot of the planetary nutrient circulation is based on things like animals that eat stuff down low in the ocean and then poop it up in the higher levels. Alas, the current situation of the planetary megafauna in and out of the water is kinda dismal in comparison with the early Pleistoscene, and there's an article about it. Rather than restate the contents, I just point you at Tony's most recent journal (which you should be reading anyway), Missing Mega Poop. The latest piece of outdoors installation art in London has caused a few raised eyebrows to say the least. 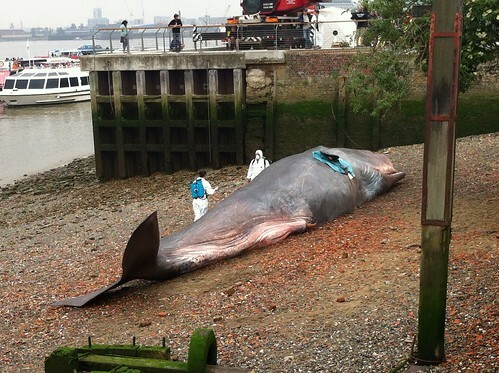 A life-size fiberglass sculpture of a beached whale has been placed on the bank of the River Thames at Greenwich, in London. This from Kuriositas (who else), and the rest of the article includes LOTS more pictures.